The latest Rasmussen Report numbers are in, and finally, after watching Begich and Stevens neck & neck in the senate race…first Begich ahead by 2….then Stevens ahead by 2…. we now have a breakaway! The latest poll has Begich leading by NINE points – an astounding net gain of 11 points since the last poll, and the largest lead by either candidate since Rasmussen began polling the race. The last week has given us little to smile about regarding Alaska politics, so this was a welcomed surprise. Begich even has a fun and creative new TV ad. I think we may need to recut that spot with someone else in line….hmm…maybe a woman in a red suit and glasses? Just a thought. Comments : Comments Off on Begich Breaks Away! Finally! 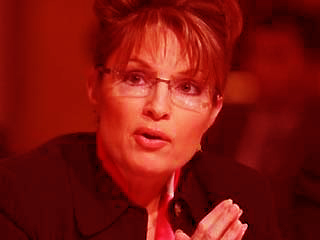 Sarah Palin’s scandal gets picked up by the National Blogosphere. Here’s the link to Daily Kos, and TPMMuckraker links to the Daily News article about the investigation. In addition to my previous commentary, also enjoy these Alaskan offerings from Progressive Alaska, and Immoral Minority, and Celtic Diva’s great coverage of the Chuck Kopp subplot to this whole sordid affair. Just for amusement, here’s a clip from a FOX News article that came out on July 11, 2008. JUNEAU, Alaska — The wipeout in the 2006 election left Republicans in such a state of dejection that they’ve overlooked the one shining victory in which a Republican star was born. The triumph came in Alaska where Sarah Palin, a politician of eye-popping integrity, was elected governor. She is now the most popular governor in America, with an approval rating in the 90s, and probably the most popular public official in any state. Her rise is a great (and rare) story of how adherence to principle–especially to transparency and accountability in government–can produce political success. Ah, what a difference a week makes.